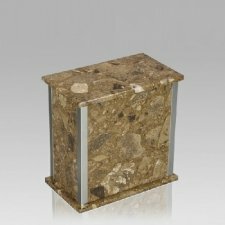 The Designer Silver Rosatica Cremation Urn in medium is crafted from rosatica agglomerate marble. The urn features a stainless steel trim and the bottom has felt to protect the surface were the urn stands. This wonderful natural stone urn will create a dignified resting place for eternity to come.